Ice sport enthusiasts tend to cluster in the colder southern parts of New Zealand. Outdoor ice sports such as traditional curling and ice skating and ice hockey have been popular in these regions since the 19th century. In the 2000s there are indoor facilities for some ice sports in Southland, Otago, Canterbury and Auckland, while participants in sports such as luge, skeleton and bobsleigh train overseas. In curling two teams of four players take turns to slide heavy granite stones across the ice towards a circular target. The sport began in Scotland in the 1500s and was introduced to southern New Zealand in the 1860s. New Zealand is one of the few places where old-style outdoor curling is still played on frozen lakes or dams. Indoor curling, which is played in international competitions, is also played in Otago and Southland. The New Zealand men’s curling team first competed in the Winter Olympics in 2006. Ice skating as a recreation has been enjoyed in the southern parts of New Zealand since the 1800s. The first indoor rinks were opened in the 1950s. In speed skating, competitors race against each other, or compete in time trials, usually on an indoor rink. 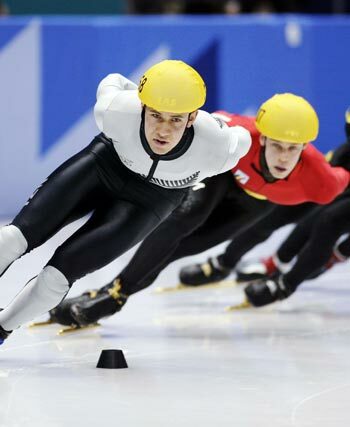 New Zealand speed skaters have taken part in international competitions, including the Winter Olympics. In figure skating, individuals, pairs or groups perform jumps, spins, lifts, turns and steps to music. Ice hockey is played on an ice rink by two teams. Six players from each team, including the goaltender (goalie), are allowed on the rink at once. It has been played in New Zealand on frozen lakes at least since the early 1900s, but in the 2000s was mainly played indoors. New Zealand players compete in national and international competitions. Several winter sports derive from sled racing, which began in Switzerland. New Zealand competitors train overseas, but there is a luge track at Naseby, Central Otago, which opened in 2008. In luge, competitors race a one- or two-person sled down a twisting track, lying face up and feet first. In skeleton one person races down the track lying on the sled face down and head first. Bobsleigh is raced in teams of two or four people. The sleds are enclosed and can reach speeds of 150 kilometres per hour.